The hunt for the Infinity Gauntlet is back on. 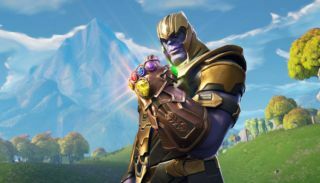 Fortnite’s Thanos limited time mode from last year seems to be making a comeback, coinciding with the debut of Avengers: Endgame later this month. The mode drops the all-powerful Infinity Gauntlet onto the map, and the player who picks it up becomes the surly purple bad guy of Marvel fame. Epic hasn’t officially announced the return of the mode yet, but dataminers have apparently found some pretty clear clues in the latest patch. New kill feed messages discovered by Skin-Tracker include the string “Yielded to the POWER of Thanos,” as well as a couple references to ice fiends and unleashing an "inferno" of some kind. It’ll be interesting to see if Epic has made any changes to the LTM since last year. In the first version of the event, Thanos couldn’t build, but he did have a powerful laser and a hefty pool of health and shields, which would regenerate every time he killed another player. The new kill feed strings also include a message about being “zapped out of the sky.” What that means isn’t clear—perhaps some kind of weather-based lightning weapon is on the way. Avengers: Endgame hits theatres April 26, so it seems likely we’ll see the Thanos LTM return in the next couple weeks if it's going to happen.